Coming to the end of this deep and late lingering winter, I’ve found myself drawn with more and more frequency away from my temporary home at this small town in the shadow of the dunes on Lake Michigan’s shoreline. Work, responsibilities, family, friends, and the community of my further inland home have been calling me back, and so, though the gas bills pile on their strain, I drive. It’s an hour one way, through the Betsie River watershed, marked by small, poor towns; wide fields; swampy tracts of cedar, tamarack, and some spruce in the lowlands; northern hardwoods and pine (red and scotch mostly) plantations in the higher elevations; gas stations; drive-in theaters; a landfill with its associated crows and ring-billed gulls, plastic bags caught on its barbed-wire fence and swaying drearily in the wind; car garages; subterranean benzine plumes; half-empty trailer parks; abandoned hotels in varying states of disrepair. More often than not it’s been snowing, the road covered in ice or slush, the distances suffused with fog and snow. It’s a mostly straight and, after a while, not particularly interesting drive, and so it makes an ideal time to listen to music, with either a wandering mind or more focused concentration. I mention all this because I don’t think I can speak of this split between these two well known and highly respected bands with very much of what one might like to call objectivity, in great part because my experience of the album is informed by and woven tightly to this personal, solitary time spent on the road through the changing landscape of northern-lower Michigan. It’s not an arbitrary connection; Falls of Rauros and Panopticon are both, and I feel absolute confidence in this statement, firmly ensconced in the highest tier of underground North American metal that has a concern fixed on the spirit and atmosphere of places that exist outside or at the edges of the city lights, under the thinning veneer of civilization and domesticity—call it nature or wildness or whatever you like—and their songs seem made to be felted and merged with actual landscapes, inner and outer. As is the state of things here, where we seem to be approaching the terminal point of the last few centuries’ path of accelerating catastrophe, and as often comes to a mind predisposed to melancholy and anxiety, I reflect during these drives mostly on loss, grief, and the fragile, transient nature of the world we have so briefly inhabited. Here: the woods fractured by development (abandoned and left to rot away nearly as quickly as it’s brought up) and denuded of its richness and variety: the ash trees dead or dying, the beech and hemlock likely soon to follow, songbird and amphibian populations reduced in my lifetime alone by numbers too high to name, the stability of weather, and with it the ease of growing food and securing other resources, being lost and replaced with uncertainty and instability, the wolves gone before me, the elk gone before me, the passenger pigeons gone before me. It’s a realization that dredges a lot of nearly lightless emotion to the surface—ideal feelings to be reflected and explored upon with the harsh and apocalyptic sounds of metal. Panopticon, eschewing the adventurous, genre testing progressions of his sound, looks back to the past and, conjuring up a frigid, minimalist black metal drawn from the early nineties in Norway, erupts with Lunn’s most pure expression of absolute rage. A claustrophobic, pitch black production suffocates the light, and it’s in this space that the songs unfold in a fury of descending tremolo riffs, cryptic and mist-laden arpeggios, and vocals—lacking any theatricality and drenched with genuine rage—that spit their hateful venom into the storm without hesitation. The faster moments are reminiscent of Judas Iscariot in the way they are often driven forward by the obsessively active drumming and sheer force of anger more so than the actual riffs themselves, though there are some excellently sinuous tremolo melodies interspersed throughout. When Lunn slows down, the mood becomes that of deep brooding—the anger of a dying god barely contained in the restrained percussion and eerie background tones and melodies. The bass lurks beneath, wandering with ominous intent in the spirit of De Mysteriis Dom Sathanas. Panzerfaust is also called to mind in the nearly unhinged vocals, and the way “Can You Loan Me A Raven?” nearly dissolves into a welter of feedback and venomous howls recalls the climax, or rather collapse, of insanity in “Quintessence”. These tracks are more than a fitting tribute to the early nineties, they’re powerful in their own right, a voice in defiance against—or is it in harmony with?—the ravages and storms of time breaking on the horizon. 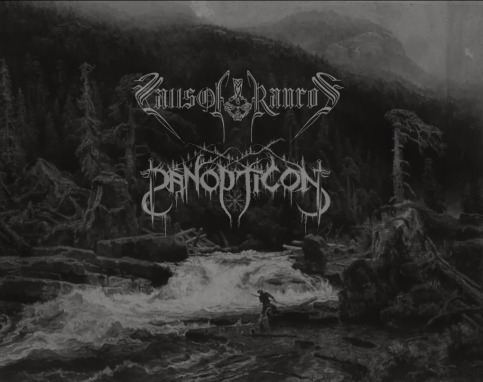 While Panopticon evokes a thoroughly masculine sense of indignation, Falls of Rauros is more feminine: still angered, still powerful, but more supporting of a sense of grief, loss, and, following all of that, a yielding to something like rebirth. If The Light That Dwells in Rotten Wood can be thought of as Falls of Rauros’ true opening statement, that is: when the band truly came into its sound, then these new songs are where they first show is what they can really do with that sound now that they’ve grown confident in it. The songwriting here is extremely concise; there’s not a single note out of place, nothing is drawn out to create an illusion of expansiveness, and even the calmer moments never loosen their hold on the vital, urgently expressed emotional core of these two songs. The production is rougher, more rehearsal space sounding, but it fits the stormy aesthetic of this release, excellently represented in the cover artwork. And, while Falls is generally well served by a stronger, clearer sound, these songs are a testament to their excellent, narrative songwriting talent in that they suffer nothing from the lack of it. And that talent is put to good use here: these two songs flow as rivers, undulate as mountains and valleys, break like waves on the rocky shores of the north Atlantic. The riffs here seem to spring from an endless font, strummed chords breaking into urgent, soaring tremolo melodies, then flowing into emotive, extremely well written solos, and back again. Acoustic guitars and (synthesized?) horns find their place here, and the acoustics, already expertly utilized on the previous album, are more perfectly and carefully integrated into the overall soundscape than before. The percussion work is tasteful, with just enough variation and energy to effectively hold up the energy of these riff-rich songs while being compelling in their own right, and the same can be spoken for the bass, with a great sense for when to follow the guitars and when to wander off into side alleys and trails. More difficult to describe in words here, as in other Falls of Rauros releases, is the quality of heart that has clearly gone into these songs. Possibly, this is why Falls and Panopticon are so well suited to a split with each other: this isn’t music that’s made by “just a band”, or for fun, or to gain recognition or kvlt credibility. It takes a serious, profound emotional investment into one’s art to create beautifully crafted songs like these. Nowhere is this more clear than in “The Purity Of Isolation”. The fragile guitar melodies, the swelling choral vocals and horns, the achingly screamed vocals, and finally the triumphant yet melancholy riff that closes out the song—this is heartbreaking, and mending, music written from a place deep inside, a place untouchable by the myopia of our small lives, a place where nothing is truly lost. ~ by jakemoran on March 26, 2014. Beautifully written Jake! Will this be a vinyl only release? This entry was posted on March 26, 2014 at 7:25 pm and is filed under ALL REVIEWS, F-reviews, P-reviews.You can follow any responses to this entry through the RSS 2.0 feed.You can leave a response, or trackback from your own site.